Entry pay of Assistant Accounts Officer of Central Civil Accounts Service will be in the Grade Pay of Rs.4800/- wef 1.1.2006 - CGA order in terms of the Hon.ble CAT, Principal Bench, New Delhi's order dated 6th March 2017. Reference is invited to Department of Expenditure Office Memorandum No. 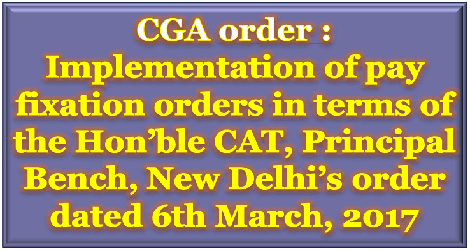 F No.8-11/2017-E.III(A) dated 7th February, 2018 issued in compliance of CAT New Delhi’s Judgement dated 06.03.2017.